RETURN! is an intensive, neurorehabilitation day treatment program that serves adults (18+) who have sustained an acquired brain injury, such as stroke, aneurysm and traumatic brain injury. Clients in the program attend sessions from 10 am to 3 pm on weekdays for 9 weeks, on average. 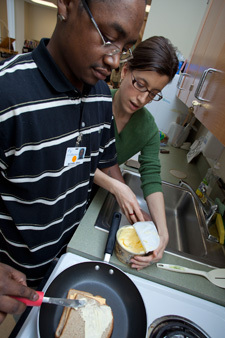 The goal of the program is to help individuals to regain independence in daily functioning and to return to work, school or primary responsibilities at home (e.g., cooking, household management, finances). RETURN! offers a structured and consistent weekly schedule of group and individual therapies that have been developed to improve mobility, cognition, self-care, and home and community living skills. RETURN! is staffed by experienced clinicians who provide a comprehensive, individualized approach to brain injury rehabilitation. Clients in the program receive outpatient therapies that are focused on improving function and learning ways to compensate for lost abilities. The group setting provides a place where clients can practice strategies to improve one’s ability to remember, understand language, plan, organize thoughts, speak, and socially interact. Team members involved in this process include experts in brain injury from the fields of physiatry, neuropsychology, speech-language pathology, occupational therapy, physical therapy, social work, therapeutic recreation, and prevocational services. Overall, the RETURN! Program provides a supportive, structured environment in which clients learn to accurately assess their abilities, promote their own healing, and efficiently learn helpful ways to overcome deficit areas. With input from the clients, their families, and the RETURN! treatment team, personalized discharge plans are developed to help persons transition back to the community and resume meaningful lifestyles.